Unique Gun Mold on the lid. Program up to 32 Users. Pre-drilled holes for mounting to the floor or shelf - (hardware included). Egg crate foam-padded bottom protects contents. The BOOM-10053 is constructed of heavy-gauge steel with soft foam on the inside to protect the pistol. High-strength lock mechanism performs reliably time after time. Precise fittings are virtually impossible to pry open with hand tools. No combinations to remember or carry a key because your fingerprint is the key that opens the safe door! Easy to program and use, it takes one press of a button and your fingerprint is programmed to open the safe. You can program up to 32 users. Also perfect for passports, documents, cash, or other valuables . 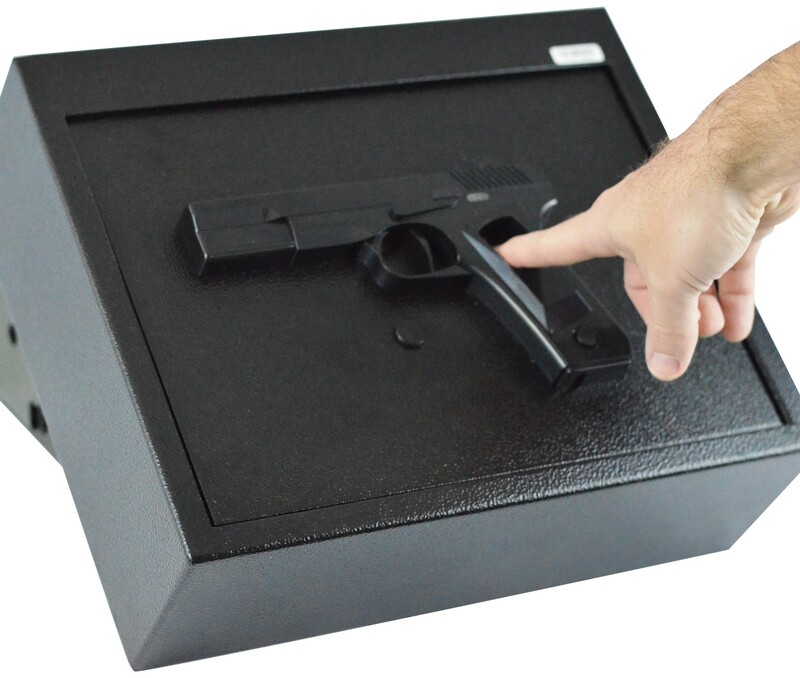 Pre-drilled holes allow the safe to be mounted into a wall, onto a shelf or counter top. Emergency back-up keys included. Operates on 4 AA batteries. The BOOM-10053 for today's security solutions.